Welcome to the Biscayne National Park Information Guide. The closest major airport is Miami International Airport is 35 miles North of the park. Car rentals are available at the airport. There is no public transportation to the park. 1. Driving to Convoy Point, take the turnpike South, and then the Homestead extension of the Florida turnpike south, to Exit 2 (Campbell Drive). Turn right from exit ramp and continue east to the next intersection (Kingman Road). Turn right and continue to S.W. 328th Street (North Canal Drive). Turn left and continue to the end of the road. It is approximately six miles, and the entrance is on the left. 2. Take US – 1, drive south to Homestead. Turn left on SW 328th Street (North Canal Drive), and continue to the end of the road. It is approximately nine miles, and the entrance is on the left. Take 75 East to US – 1 South, then drive south to Homestead. Turn left on SW 328th Street (North Canal Drive), and continue to the end of the road. It is approximately nine miles, and the entrance is on the left. Biscayne National Park headquarters is located at Convoy Point, Florida. Biscayne National Park has the simple beauty of a child’s drawing. Clear blue water. Bright yellow sun. Big sky. Dark green woodlands. And here and there a boat, a bird. It is a subtropical place where mainland mangrove shoreline, a warm shallow bay, many small islands or keys and living coral reefs intermingle. Together they comprise a vast, almost pristine wilderness and recreation area along the southeast edge of the Florida peninsula. The park, located just 21 miles east of Everglades National Park, was established as a national monument in 1968. In 1980 it was enlarged to 181,500 acres and designated as a national park to protect a rare combination of terrestrial and undersea life, to preserve a scenic subtropical setting, and to provide an outstanding spot for recreation and relaxation. Biscayne National Park is a wonderful place to visit. The mangrove shoreline, crystal clear waters, emerald isles, and living coral reefs attract near 500,000 visitors a year. Most of these visitors enter the park by private boat. They fish, cruise, and enjoy the waters of the park. They picnic and camp on the islands. And with snorkel or dive tanks, they explore the exciting kaleidoscope of life which is the living coral reefs. The rest of the park visitors arrive by car at Convoy Point, location of the park’s headquarters and the Dante Fascell Visitor Center. Here visitors can picnic, fish, canoe, explore the Visitor Center, or take one of the boat tours offered by the park’s concessioner, Biscayne National Underwater Park, Inc. The concession offers gift sales, canoe rentals, glass bottom boat tours, snorkel trips, scuba trips, and transportation to the island for campers. On Florida’s southern Atlantic coast,Biscayne National Park contains approximately 181,500 acres, 95 % is under water, so most of the activities in this national park are water activities: boating, canoeing, diving, fishing, sailing, snorkeling, swimming, water skiing and camping. It contains well-sheltered section of Biscayne Bay, about 45 low islands, called “keys,” and about 20 miles of mainland mangrove shoreline. The earliest known residents of what is now the Biscayne National Park were the Tequesta Indians. They lived by fishing and hunting for sea turtles, sharks, sailfish, stingrays, and sea mammals. The manatee, presently an endangered species, was hunted for food as was the porpoise. Non marine animals hunted were deer and freshwater turtles. The Tequesta also gathered native plants, such as prickly pear, sea grapes and coco plum. When the Spaniard explorers arrived, the Tequestas were using pottery, dugout canoes, and hunting with bows and arrows. Marine shells were used as tools, decorations and trade items. Their refuse and trash built up mounds of shells and animal bones at camp and village sites. By 1763, diseases brought to the new world by Europeans and raids by other Indian tribes and the Spanish, all but wiped out the Tequesta. Obtain a backcountry permit for any overnight use. Building ground fires is prohibited. Pets are prohibited on park trails and in the backcountry. Birds are drawn to the bay year round. Each follows its own instincts for survival. Brown pelicans patrol the surface of the bay, diving to catch their prey. White ibis meander across exposed mud flats, probing for small fish and crustaceans. Large colonies of little blue herons, snowy egrets, and other wading birds nest seasonally in the protected refuge of the Arsenicker Keys. The extremely shallow waters surrounding these mangrove islands in the south bay are especially well suited for foraging. Biscayne National Park is a wonderful place to visit. The mangrove shoreline, crystal clear waters, emerald isles, and living coral reefs attract near 500,000 visitors a year. Most of these visitors enter the park by private boat. They fish, cruise, and enjoy the waters of the park. They picnic and camp on the islands. And with snorkel or dive tanks, they explore the exciting kaleidoscope of life which is the living coral reefs. But boating in the park can be difficult to protect yourself and the park’s resources requires skill and knowledge. Camping is allowed in campgrounds and at designated backcountry sites with a free permit. Building wood or ground fires is prohibited. There are two campgrounds in Biscayne National Park. They are located on two different Florida Key Islands. One campground is located on Boca Chita Key and the other is on Elliott Key. These campgrounds are open year round. Boat transportation must be arranged to these islands. All campgrounds operate on a first come first serve basis. Register on the islands at the kiosk located next to the harbor. The automated registration machine accepts U.S. currency. There is no fee to enter Biscayne National Park. The are fees for camping and overnight docking. The overnight docking fee is $ 15.00 per night at Boca Chita Key Harbor and Elliott Key Harbor ($ 7.50 per night for holders of Golden Age or Golden Access Passes). Fishing licenses are not required for ocean fishing. A Florida license is required when fishing in the bay. Park rangers can supply fishing information. Gumbo limbo, Jamaican dogwood, Strangler fig, Devil’s potato, Satin leaf Touchwood, and mahogany common in the West Indies are also found in this tiny area of south Florida. North flowing air and ocean currents and storms delivered the pioneer seeds and plants that eventually grew into the islands’ lush dark jungle like forests. There are no restaurants located in the park. You can always bring your own food as there are picnic tables and grills at Convoy Point, Adams Key, Boca Key and Elliott Key or there are restaurants in the local communities listed above. Stay on established trails. Carry out all refuse. 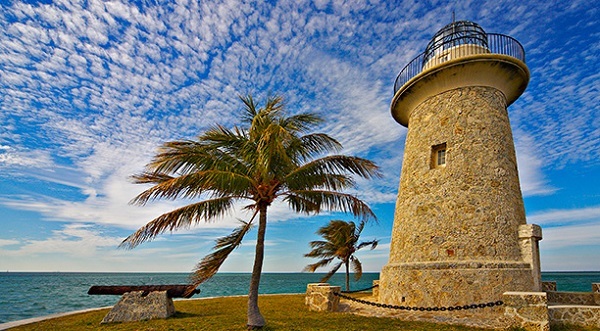 In Biscayne National Park, the only lodging available is the campgrounds on Boca Chita Key and Elliott Key. The only park permit fee is for overnight docking. Pets are only allowed in the developed areas of Convoy Point and Elliott Key and must be on a kept on a leash six feet or less in length. Pets, except those used to assist individuals with disabilities, are not allowed on any other islands (including Boca Chita Key and Adams Key), in the shallow waters (less than three feet deep) surrounding the islands, or on boats docked at the islands. Join a National Park Service ranger to explore Biscayne’s natural and cultural history. Join a ranger to learn about the forces that once shaped this landscape – and continue to do so, see the Calendar Page. Ranger / Naturalist programs include scheduled talks. Programs are provided by park naturalists year-round. These are just some of the ways to discover the diversity of the scenic, natural and historic wonders that comprise Biscayne National Park. Swimming, diving, snorkeling, wading and waterskiing are permitted. No lifeguards are on duty. All activities are at your own risk. Check at the visitor center and rangers for more information. The only visitor center and park headquarters is located at Convoy Point. Convoy Point and park headquarters are open year round. Biscayne’s subtropical climate is characterized by warm, wet summers (May through Oct) and mild, dry winters (Nov through Apr). Expect abundant sunshine and high humidity year round. High temperatures average in the high 80s and low 90s in summer and in the mid 70s and low 80s in winter. Annual rainfall fluctuates greatly, but 65 inches or more are common. Most rain falls in summer in brief, intense afternoon thunderstorms. Summer and fall are peak seasons for tropical storms and hurricanes.